This resource gives an outline of historical and more recent events that have had an impact on Aboriginal peoples in Queensland. give insight into Aboriginal peoples' relationships with non-Indigenous Queenslanders, government agencies and their representatives. 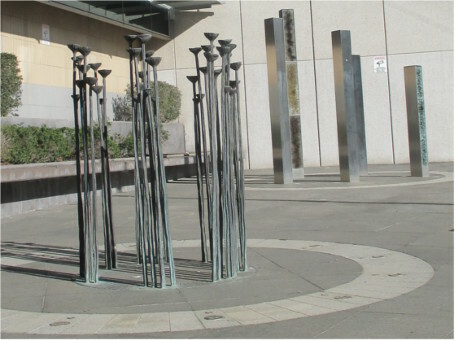 The Witnessing to Silence sculpture by Badtjala artist, Fiona Foley, is an installation that consists of stainless steel columns embedded with ash in laminated glass, bronze lotus lilies, and granite pavers etched with place names. The work is a memorial to Aboriginal people massacred in Queensland during colonial settlement and expansion. The panels of ash represent the way in which the bodies of the massacred people were disposed of — by burning and discarding — in waterways (the lotus lilies). The pavers which form part of the installation are etched with the names of ninety-four Queensland towns and places that are sites where massacres of Aboriginal people are known to have taken place. Download Aboriginal people in Queensland: a brief human rights history for printing (PDF File, 2.8 MB) , or access each chapter separately using the Contents list.